Migraine is a medical condition. Most people who suffer from migraines get headaches that can be quite severe. A migraine headache is usually an intense, throbbing pain on one, or sometimes, both sides of the head. Most people with migraine headache feel the pain in the temples or behind one eye or ear, although any part of the head can be involved. Besides pain, migraine also can cause nausea and vomiting and sensitivity to light and sound. Some people also may see spots or flashing lights or have a temporary loss of vision. Migraine can occur any time of the day, though it often starts in the morning. The pain can last a few hours or up to one or two days. Some people get migraines once or twice a week. Others, only once or twice a year. Most of the time, migraines are not a threat to your overall health. But migraine attacks can interfere with your day-to-day life. Most often, migraine affects people between the ages of 15 and 55. Most people have a family history of migraine or of disabling headache. They are more common in women. Migraine often becomes less severe and less frequent with age. Migraine pain and symptoms affect 29.5 million Americans. Migraine is the most common form of disabling headache that sends patients to see their doctors. The exact cause of migraine is not fully understood. Most researchers think that migraine is due to abnormal changes in levels of substances that are naturally produced in the brain. When the levels of these substances increase, they can cause inflammation. This inflammation then causes blood vessels in the brain to swell and press on nearby nerves, causing pain. Genes also have been linked to migraine. People who get migraines may have abnormal genes that control the functions of certain brain cells. Talk with your doctor about what sets off your headaches to help find the right treatment for you. Yes, there are many forms of migraine. The two forms seen most often are migraine with aura and migraine without aura. Migraine without aura (previously called common migraine). With this form of migraine, a person does not have an aura but has all the other features of an attack. How can I tell if I have a migraine or a bad tension-type headache? Compared with migraine, tension-type headache is generally less severe and rarely disabling. 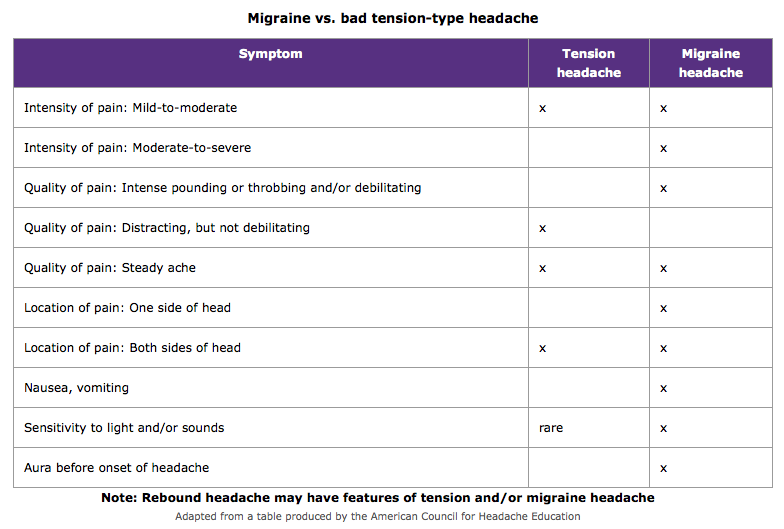 Compare your symptoms with those in this chart to see what type of headache you might be having. Although fatigue and stress can bring on both tension and migraine headaches, migraines can be triggered by certain foods, changes in the body’s hormone levels, and even changes in the weather. There also are differences in how types of headaches respond to treatment with medicines. Although some over-the-counter drugs used to treat tension-type headaches sometimes help migraine headaches, the drugs used to treat migraine attacks do not work for tension-type headaches for most people. You can’t tell the difference between a migraine and a tension-type headache by how often they occur. Both can occur at irregular intervals. Also, in rare cases, both can occur daily or almost daily. How can I tell if I have a migraine or a sinus headache? If you answer “yes” to two or three of these questions, then most likely you have migraine with sinus symptoms. A true sinus headache is rare and usually occurs due to sinus infection. In a sinus infection, you would also likely have a fever and thick nasal secretions that are yellow, green, or blood-tinged. A sinus headache should go away with treatment of the sinus infection. Your doctor may also do an exam and ask more questions about your health history. This could include past head injury and sinus or dental problems. Your doctor may be able to diagnose migraine just from the information you provide. You may get a blood test or other tests, such as CT scan or MRI, if your doctor thinks that something else is causing your headaches. Work with your doctor to decide on the best tests for you. Are migraine headaches more common in women than men? Yes. About three out of four people who have migraines are women. Migraines are most common in women between the ages of 20 and 45. At this time of life women often have more job, family, and social duties. Women tend to report more painful and longer lasting headaches and more symptoms, such as nausea and vomiting. All these factors make it hard for a woman to fulfill her roles at work and at home when migraine strikes. I get migraines right before my period. Could they be related to my menstrual cycle? More than half of migraines in women occur right before, during, or after a woman has her period. This often is called “menstrual migraine.” But, just a small fraction of women who have migraine around their period only have migraine at this time. Most have migraine headaches at other times of the month as well. How the menstrual cycle and migraine are linked is still unclear. We know that just before the cycle begins, levels of the female hormones, estrogen and progesterone, go down sharply. This drop in hormones may trigger a migraine, because estrogen controls chemicals in the brain that affect a woman’s pain sensation. Talk with your doctor if you think you have menstrual migraine. You may find that medicines, making lifestyle changes, and home treatment methods can prevent or reduce the pain. Can migraine be worse during menopause? If your migraine headaches are closely linked to your menstrual cycle, menopause may make them less severe. As you get older, the nausea and vomiting may decrease as well. About two-thirds of women with migraines report that their symptoms improve with menopause. But for some women, menopause worsens migraine or triggers them to start. It is not clear why this happens. Menopausal hormone therapy, which is prescribed for some women during menopause, may be linked to migraines during this time. In general, though, the worsening of migraine symptoms goes away once menopause is complete. In some women, birth control pills improve migraine. The pills may help reduce the number of attacks and their attacks may become less severe. But in other women, the pills may worsen their migraines. In still other women, taking birth control pills has no effect on their migraines. The reason for these different responses is not well understood. For women whose migraines get worse when they take birth control pills, their attacks seem to occur during the last week of the cycle. This is because the last seven pills in most monthly pill packs don’t have hormones; they are there to keep you in the habit of taking your birth control daily. Without the hormones, your body’s estrogen levels drop sharply. This may trigger migraine in some women. Talk with your doctor if you think birth control pills are making your migraines worse. Switching to a pill pack in which all the pills for the entire month contain hormones and using that for three months in a row can improve headaches. Lifestyle changes, such as getting on a regular sleep pattern and eating healthy foods, can help too. Yes. Stress can trigger both migraine and tension-type headache. Events like getting married, moving to a new home, or having a baby can cause stress. But studies show that everyday stresses — not major life changes — cause most headaches. Juggling many roles, such as being a mother and wife, having a career, and financial pressures, can be daily stresses for women. Try to figure out what causes you to feel stressed. You may be able to cut out some of these stressors. For example, if driving to work is stressful, try taking the bus or subway. You can take this time to read or listen to music, rather than deal with traffic. For stressors you can’t avoid, keeping organized and doing as much as you can ahead of time will help you to feel in control. Migraine has no cure. But your migraines can be managed with your doctor’s help. Together, you will find ways to treat migraine symptoms when they happen, as well as ways to help make your migraines less frequent and severe. Your treatment plan may include some or all of these methods. Medicine. There are two ways to approach the treatment of migraines with drugs: stopping a migraine in progress (called “abortive” or “acute” treatment) and prevention. Many people with migraine use both forms of treatment. Triptans, which work by balancing the chemicals in the brain. Examples include sumatriptan (Imitrex®), rizatriptan (Maxalt®), zolmitriptan (Zomig®), almotriptan (Axert®), eletriptan (Relpax®), naratriptan (Amerge®), and frovatriptan (Frova®). Triptans can come as tablets that you swallow, tablets that dissolve on your tongue, nasal sprays, and as a shot. They should not be used if you have heart disease or high blood pressure. Ergot derivatives (ergotamine tartrate and dihydoergotamine), which work in the same way as triptans. They should not be used if you have heart disease or high blood pressure. Most acute drugs for migraine work best when taken right away, when symptoms first begin. Always carry your migraine medicine with you in case of an attack. For people with extreme migraine pain, a powerful “rescue” drug might be prescribed, too. Because not everyone responds the same way to migraine drugs, you will need to work with your doctor to find the treatment that works best for you. Get up and go to bed the same time every day. Eat healthy foods and do not skip meals. Learn ways to reduce and cope with stress. Alternative methods. Biofeedback has been shown to help some people with migraine. It involves learning how to monitor and control your body’s responses to stress, such as lowering heart rate and easing muscle tension. Other methods, such as acupuncture and relaxation, may help relieve stress. Counseling also can help if you think your migraines may be related to depression or anxiety. Talk with your doctor about these treatment methods. Women who use acute pain-relief medicine more than two or three times a week or more than 10 days out of the month can set off a cycle called rebound. As each dose of medicine wears off, the pain comes back, leading the patient to take even more. This overuse causes your medicine to stop helping your pain and actually start causing headaches. Rebound headaches can occur with both over-the-counter and prescription pain-relief medicines. They can also occur whether you take them for headache or for another type of pain. Talk to your doctor if you’re caught in a rebound cycle. I am pregnant. Can my migraines still be treated? Some migraine medicines should not be used when you are pregnant because they can cause birth defects and other problems. This includes over-the-counter medicines, such as aspirin and ibuprofen. Talk with your doctor if migraine is a problem while you are pregnant or if you are planning to become pregnant. Your doctor might suggest a medicine that will help you and that is safe during pregnancy. Home treatment methods, such as doing relaxation exercises and using cold packs, also might help ease your pain. The good news is that for most women migraines improve or stop from about the third month of the pregnancy. I am breastfeeding. Will taking medicine for migraine hurt my baby? Ask your doctor about what migraine medicines are safe to take while breastfeeding. Some medicines can be passed through breast milk and might be harmful to your baby. What are some ways I can prevent migraine? The best way to prevent migraine is to find out what triggers your attacks and avoid or limit these triggers. Since migraine headaches are more common during times of stress, finding healthy ways to cut down on and cope with stress might help. Talk with your doctor about starting a fitness program or taking a class to learn relaxation skills. Talk with your doctor if you need to take your pain-relief medicine more than twice a week. Doing so can lead to rebound headaches. If your doctor has prescribed medicine for you to help prevent migraine, take them exactly as prescribed. Ask what you should do if you miss a dose and how long you should take the medicine. Talk with your doctor if the amount of medicine you are prescribed is not helping your headaches. What should I do when a migraine begins? If you take migraine medicine, take it right away. Drink fluids, if you don’t have nausea during your migraine. Lie down and rest in a dark, quiet room, if that is practical.